As the season concluded I was honored to have been named 1st Team Sierra Foothill All League and 2nd team Sacramento Region All Metro Team. I was also named to the Sacramento Region Holiday Classic All Star Team and we played against the East Bay All Stars in Danville California on December 23, and here are some video highlights. Although we only made it to the first round of playoffs, two teams from our League won section championships: Granite Bay (D1) and Del Oro( D3). Del Oro went on to the California Bowl State Championship D2 game losing to Helix of San Diego. The Miners finished the regular season 7-3 and headed for the playoffs in early November. We had a solid year and improved every week. Here is an article about my team and me as we entered post season play. Earlier in the season our local newspaper did a profile on me that talked about both football and my work with Club Interact at my high school. On 11-11-11 we played our 11th and final game of the season when we lost in the playoffs to Franklin of Elk Grove. I am proud of our team and to have started every game of my 4 years in high school. It was exciting in 2009 when we won the CIF Division 1 Section Championship and exciting to be back in the playoffs again this year too. I am looking very forward to the opportunity to continue to play in college next year. Also, I attended a number of camps this past summer including the Yale and Princeton Camps as well as Cal and Cal Poly among others. CLICK HERE FOR CAL CAMP HIGHLIGHTS from the UC Berkeley Camp on JUNE 19, 2011. I am a Senior and 2nd year starting offensive center for the Nevada Union High School Miners – one of Northern California’s top high school football programs. I’ve been playing organized sports since I was 6 years old including football, baseball, basketball, volleyball (including participating on the Nor Cal Junior Olympics Club Team) and even travel ice hockey. I also am on the NU Varsity Track Team too. While I love them all – my focus is now on football and specifically the offensive center position. 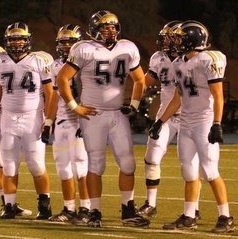 You can learn more about me here as well as my team on the Nevada Union Football Page on Facebook. I’ve also added a little bit more about me and my extracurricular activities here too.